The fragrance of plum blossoms is intoxicating, and something I look forward to every spring. Plum blossom season is brief, usually lasting only a few days. Early spring snow, wind, and rain wreak havoc on these delicate blooms, so get out there and harvest as soon as you see them. 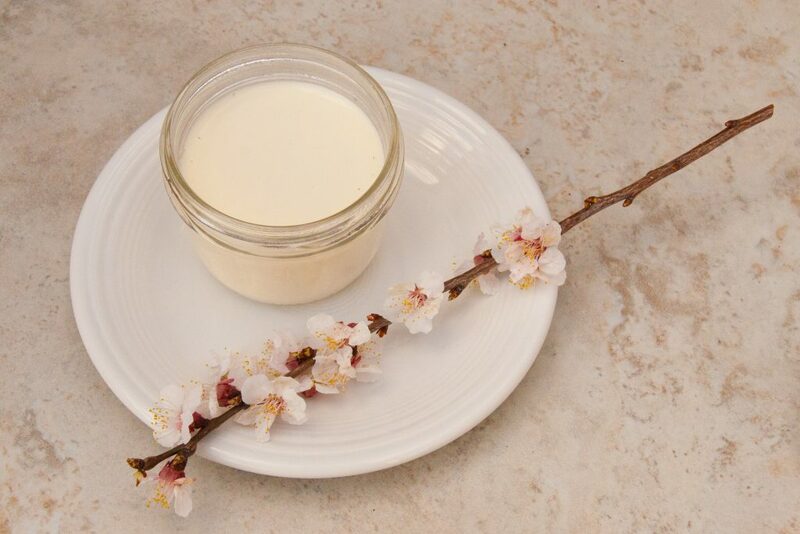 Usually I make plum blossom liqueur, but this time I thought of infusing the flowers in cream for a floral panna cotta. What a good idea! Panna cotta (Italian for cooked cream) looks fancy, but is actually pretty easy to make, once you understand the steps. The texture is lovely, and somehow it manages to be both light and rich at the same time. How is that possible?! I don’t know. Let’s just say it’s magic and move on to the recipe. Stir together the plum blossoms and cream, then cover, refrigerate, and let the cream infuse for two days. When you’re ready to cook, put the water in a saucer and sprinkle the gelatin on top of the water to let the gelatin bloom. Strain the cream, pressing on the plum blossoms to remove as much liquid as possible. If you end up with slightly less than 2 cups of cream, you can make up for that by adding a little extra milk. The important thing is to have 4 cups of liquid. Combine the strained cream, milk, and sugar in a saucepan and bring it just to a simmer, whisking to avoid scorching. Remove from the heat, and whisk in the bloomed gelatin until it’s completely dissolved. Test for this by rubbing the liquid between your fingers to make sure it’s silky, not grainy. If it’s grainy, keep whisking. Place the saucepan in an ice bath (a shallow pot or pan with a combination of ice cubes and water) and whisk until the liquid is lukewarm. This is an essential step, without which the texture of your panna cotta will not be right. Pour the lukewarm liquid into mini-canning jars or ramekins, and refrigerate four hours or overnight. I use 4 oz. canning jars because I have a lot of them, they’re cute, and I appreciate that each can be covered individually without using plastic wrap. Also, I can eat two of them and not hate myself. The texture of a perfect panna cotta is barely jiggly, not stiff like jello. In fact, when you first look at it, you may not realize it has jelled. This delicate texture is just one of the things that makes panna cotta so special. The unique flavor of plum blossoms takes it over the top. Ice cream! Why didn’t I think of that? Great idea! Hi Elise, Yes, you use the whole blossom, and yes you strain them from the cream. As for picking all the blossoms and not having any plums…no need to worry about that! Plums produce MANY more flowers than fruit. In fact, if every flower produced a fruit, the tree would never be able to support itself. The nutrition necessary for ripening the crop and the weight of the crop itself would be more than the tree could handle. The recommended spacing for ripening plums is one every three inches, yet the flowers grow much more closely together, e.g. in three inches of branch space you could easily have 15-20 flowers. If you were growing fruit, you’d need to thin the crop anyway, so picking a few flowers (and believe me, two cups from one tree barely makes a dent! ), simply means less thinning later on. Additionally, the flowers of several purple leaf plum varieties rarely produce fruit; they bloom so early that their pollination rate is poor. So harvesting these flowers doesn’t reduce your harvest.